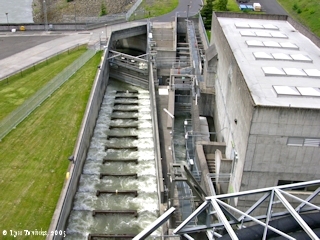 "Bonneville Dam ... 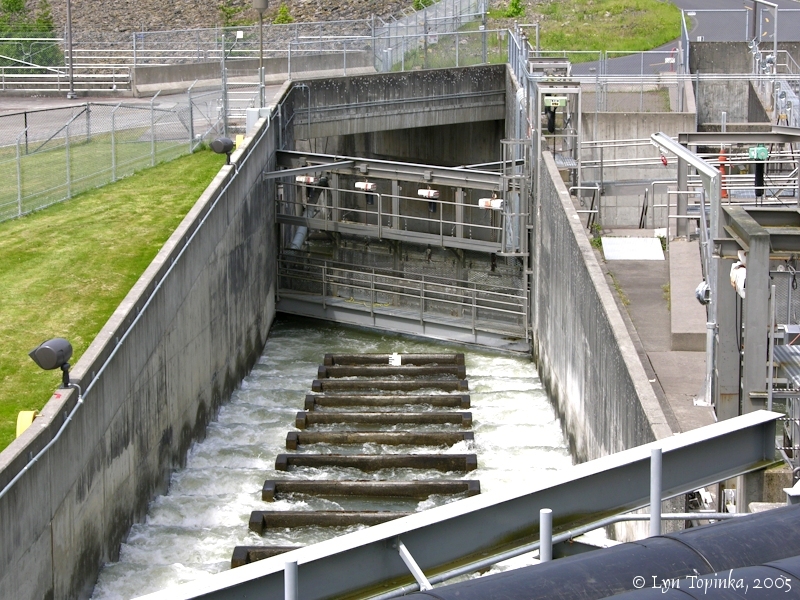 Fish Ladders, Counting, and Viewing"
Today Fish Ladders exist on both sides of the Bonneville Dam and can be viewed from Visitor Center's reached via Interstate 80 in Oregon and Highway 14 in Washington. The Washington-side Visitor Center is located at the North Powerhouse. 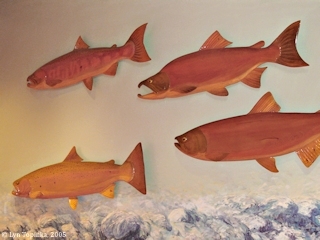 The original design of Bonneville Dam included three locations of "fishways", one on each end of the Spillway Dam (in it's day the Spillway Dam was on the north side of the Columbia) and one at the Powerhouse on the Oregon side. 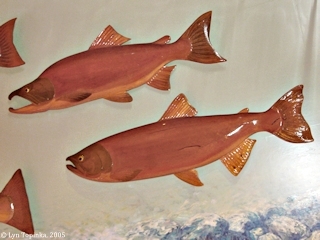 Each "fishway" consisted of a collecting system, a fish ladder, and a pair of fish-locks. 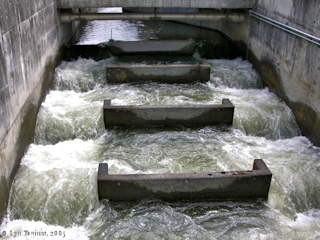 The fish ladders and fish-locks could be operated simultaneously or separately. Each fish ladder was 40 feet wide and circled from a lower water level to a higher level. Every 16 feet there were 6-foot-high barriers to regulate the pools. Within each partition were submerged openings, 2-feet square, through which the fish could swim. 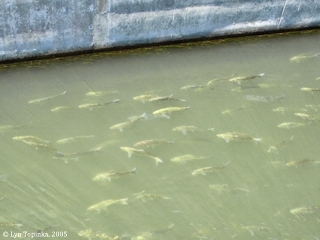 The fish-locks operated like navigational locks, with water being entered from the bottom. 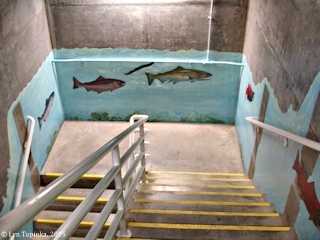 A "collecting system" was installed at Bonneville Dam to encourage the fish towards the ladders and locks. Auxiliary water could be released by a conduit system which increased the flow at the entrance to that of a fair-sized river. Click image to enlarge Penny Postcard: Bonneville Dam fish ladders, north side, ca.1940s. Penny Postcard, ca.1940s, "Fish Ladders, North Side Bonneville Dam, Washington-Oregon.". Photo by Wesley Andrews. Published by Wesley Andrews Co., Portland, Oregon. In the private collection of Lyn Topinka. 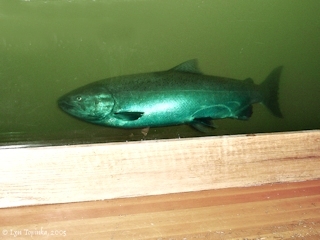 Click image to enlarge Bonneville Dam fish run, North Powerhouse. Image taken June 19, 2005. Early fish counting was done by an employee stationed in a tower who counted the fish as they came through a 2-foot-wide passage. An overhead light illuminated them and a white box below made for easier species identification. "... As a means of observing the success of the fishways, fish-counting stations have been installed in each ladder. 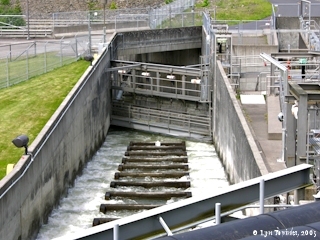 Each counting station consists of a picketed barrier in which there are three gate controlled openings, two feet wide for the passage of fish. 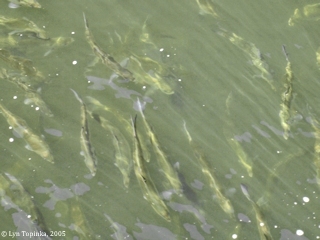 A submerged, white platform over which the fish must pass as they leave the counting gate aids the identification of species. The counting gates remain closed except when an observer is present to count the fish. Experience has shown that there is very little movement of fish at night. Counting, there for, generally is limited to the hours of daylight, the gates being kept closed at night. During the peak of the run two or three counting station in each ladder are operated at one time. Each species of fish is counted separately and counts are recorded hourly. During the first season actual count showed 271,656 Chinook, 74,989 Blueback, 15,298 Silver, 2,107 Chum Salmon, 106,884 Steelhead Trout, 2,213 other game fish, 5,321 Shad, 376,272 scrap fish (Sucker, Squawfish, Chubs, Carp, etc. 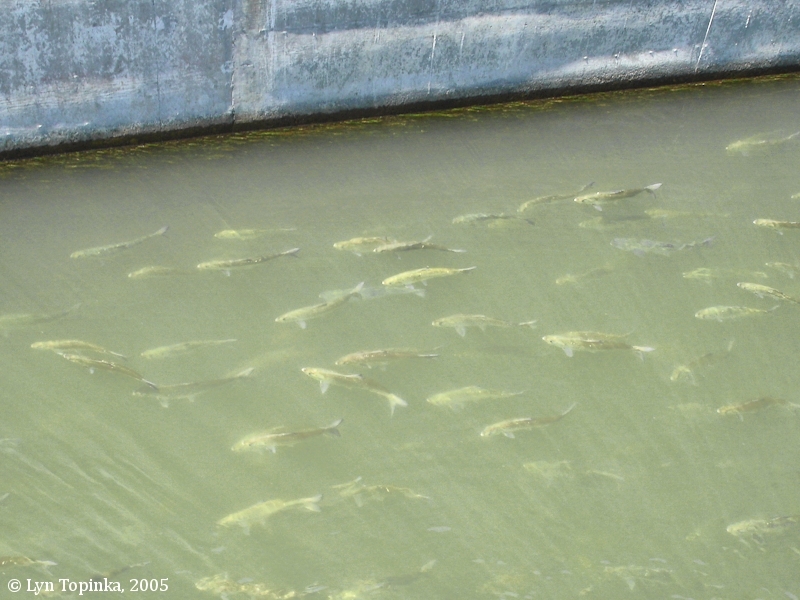 ), 3,102 White Fish, and 223,248 Lamprey passing over the counting stations on the way upstream. ..."
Click image to enlarge Penny Postcard: Bonneville Dam, Salmon Counting, ca.1940s. Penny Postcard, 1940s, "Counting Salmon at Fish Ladder - Bonneville Dam, Oregon.". Photo by Sawyer. Card #17-106. In the private collection of Lyn Topinka. 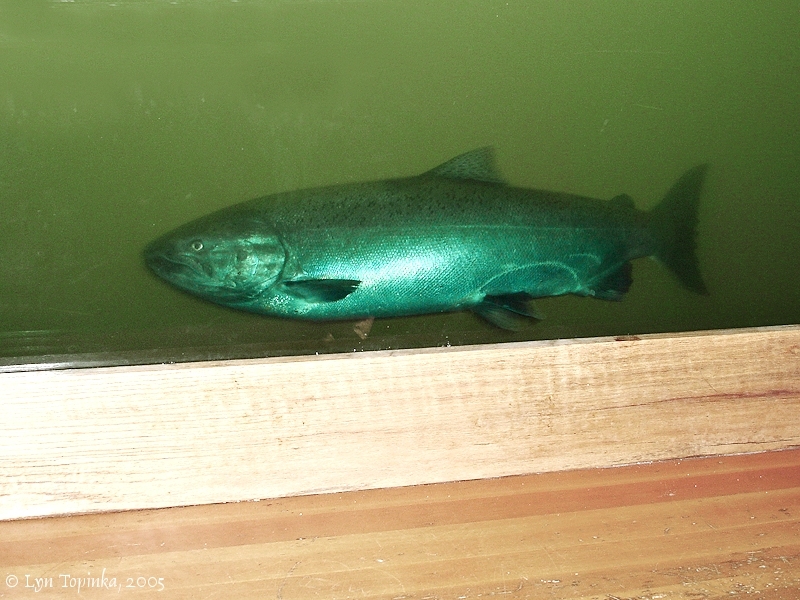 Today the fish counting is done from an room near the public Fish Viewing rooms. The Oregon side counting area has a webcam view (at least in 2005 and 2006), allowing folks around the world to watch the fish pass the Bonneville Dam. Click image to enlarge Stairs to Fish Viewing, Bonneville Dam, North Powerhouse. Image taken June 19, 2005. 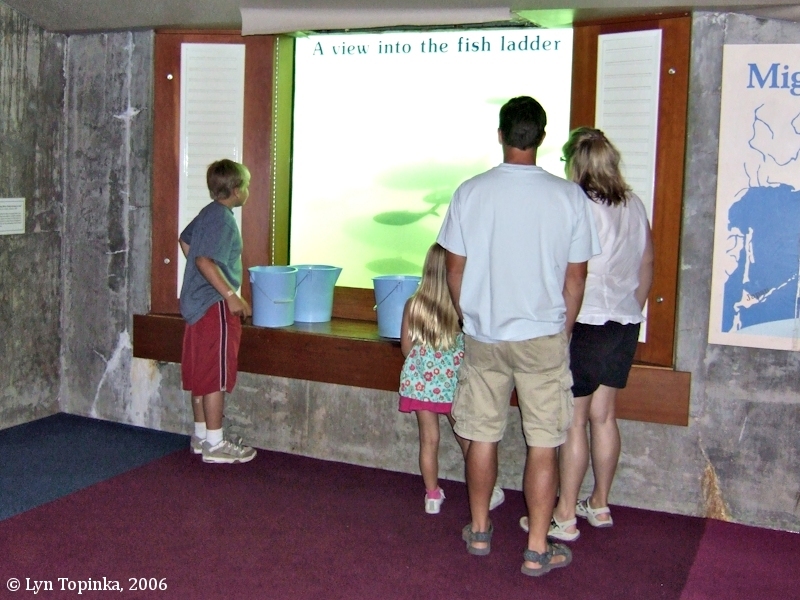 Click image to enlarge Display, Fish Viewing, Bonneville Dam, North Powerhouse. Image taken May 13, 2005. 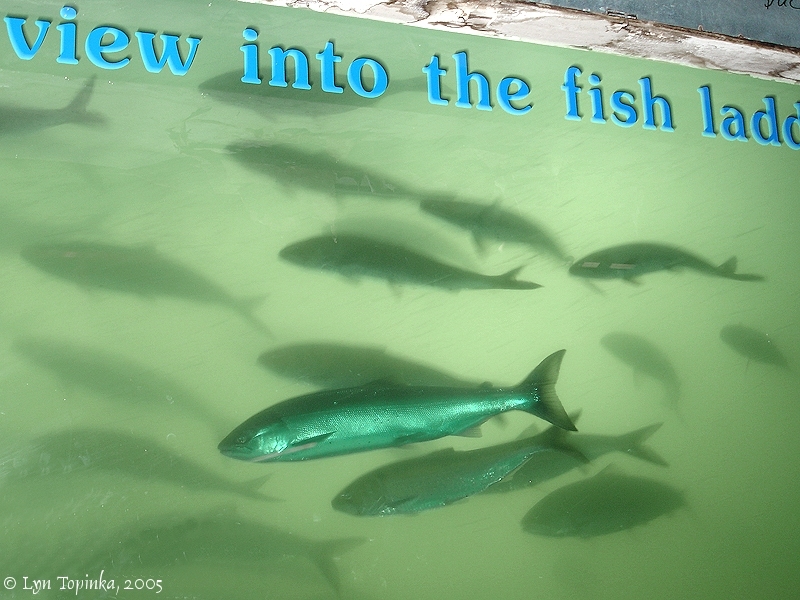 Click image to enlarge "A view into the fish ladder", Bonneville Dam Fish Viewing Window. Bonneville Dam's Washington side Fish Viewing Window. Image taken June 19, 2005. 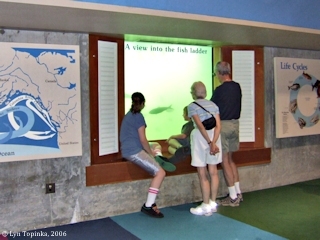 Click image to enlarge Bonneville Dam Fish Viewing Window. Image taken July 2, 2006. 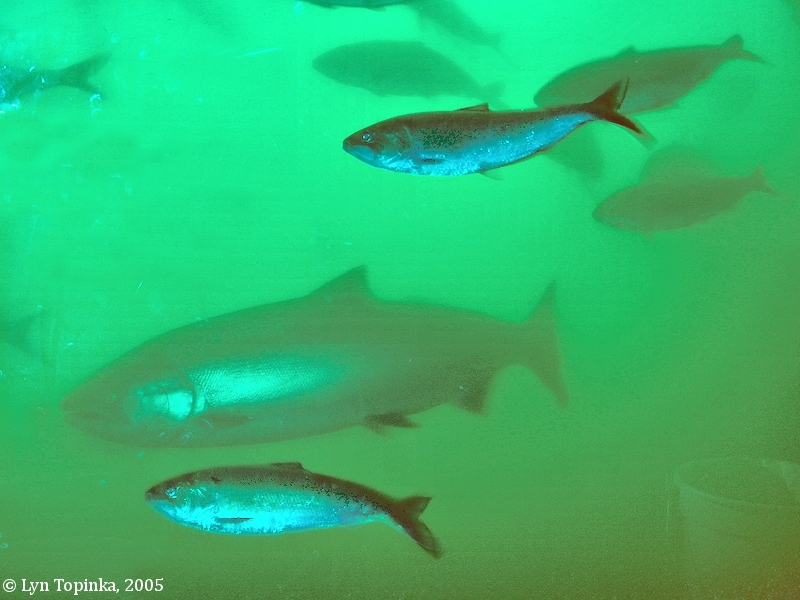 Click image to enlarge Wild Salmon, Bonneville Dam Fish Viewing Window. Image taken May 13, 2005. Click image to enlarge Salmon with Shad, Bonneville Dam Fish Viewing Window. Image taken June 19, 2005. The fish count for June 19, 2005, for the Washington fish ladder was: 1,103 Chinook salmon adults, 92 Chinook jacks, 221 Steelhead (total), 76 Steelhead (wild), 20,630 Shad, 1,850 Sockeye salmon, and 149 Lamprey. 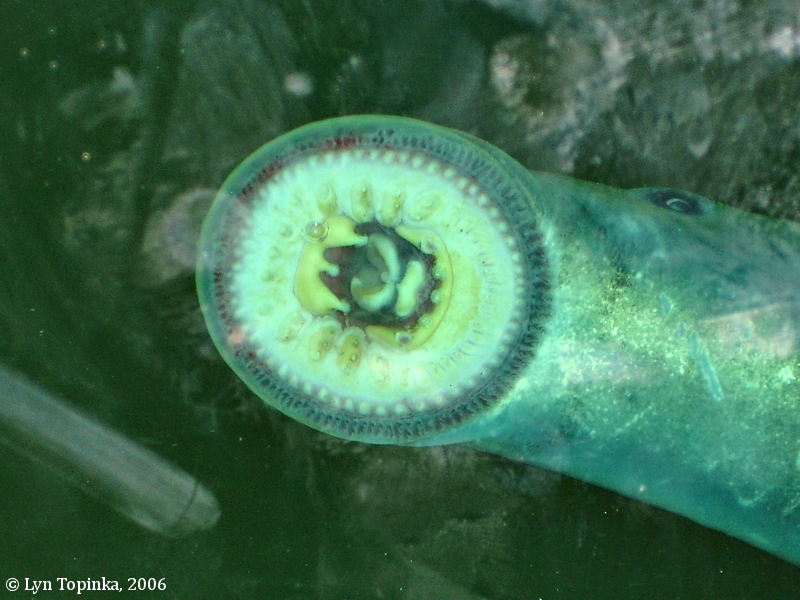 Click image to enlarge Lamprey, Bonneville Dam Fish Viewing Window. Image taken July 2, 2006. Click image to enlarge Penny Postcard: Bonneville Dam, Salmon Counting Station, ca.1940s. Penny Postcard, 1940s, "Fish counting station.". Card #8-23. In the private collection of Lyn Topinka.